Daniel Simon is the designer the car industry couldn't constrain. Formerly at VW, with work at Bugatti also under his belt, the guy's imagination was simply too vast to be stuck doing door handles or dashboards. 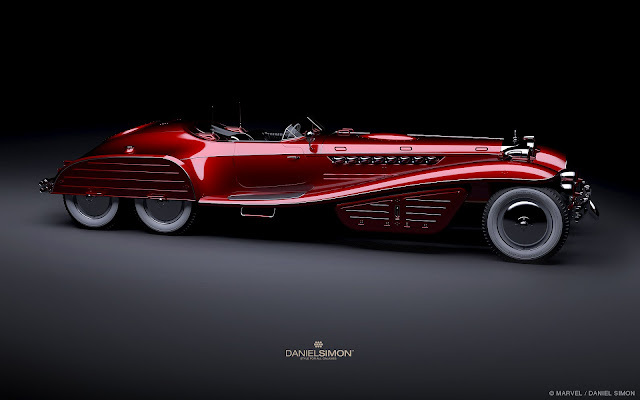 Galactically vast, you could say, if you've ever checked out the brilliant work on his Cosmic Motors website, which posits an automotive future full of radical visual remixes of Porsche 917s, Can-Am McLarens and more. With girls. When Hollywood came calling, Simon put his stunning visual imagination to work on the vehicles in Tron: Legacy . Simon has just re-rendered one of those - the almost psychedelically cool Schmidt Hydra V16 Coupe - in a beautiful HD quality short film, which you can watch here. "Joe Johnston, who directed Captain America, is a huge car fanatic himself," Simon tells us on the phone from his Los Angeles office, "but I was worried that he thought that my work was maybe too futuristic or stylised. But he hired me. The film is set in 1942 and the main villain, Schmidt, has this fanatical vision for the future. So my brief was to dream up something that would have seemed wildly futuristic, but in 1942..."
The result is an awesome steam-punk mash-up of Auto Union Type C and Avus stream-liner, Mercedes 540K, pre-war Bentleys, and the half-track Mercedes G4 staff car favoured by Hitler and his goons in the Wehrmacht. "We started off looking at the Excalibur [awful ersatz '70s US 540K replica]," Simon says, "but there was just no evil there. The car had to be bigger, and more menacing. So I scaled up one of our designs, and found myself in the parking lot measuring truck wheels and tyres. Which was when I realised this thing was definitely going to be truck-based." With its 10 wheels and 7.62m length, the Hydra Coupe almost steals the film, though the real thing - which was built on a truck chassis - had a dragster engine but no suspension. As ever with Simon's work, the surfacing is astoundingly real, and the quality of the film allows you to luxuriate in the detail in the car's submarine-inspired interior. "I wanted to show how much love and passion goes into movie production design," Simon says. "You're usually too busy to notice it because you'll be immersed in the story." It's also a teaser for Simon's next project, due to be unveiled in May 2013. ‘It's my own futuristic automotive franchise,' he says mysteriously. ‘There'll be a book first, and it features all my usual obsessions - speed, racing, heroism...' This interview has taken by BBCtopgear.